It's the last day of December and I have just over eight hours left to finish my Monthly. All I need are two Fractals. Yes, I finally got my teeth gritted, my loins girded and stood in the Grand Plaza yelling "LFG Fractals 1!". 10 seconds later I had a group. I introduced myself. "Hi! I've never done one of these before". My first toe dipped in the GW2 Dungeon pool and I find myself splashing around with a full group of Fractal Virgins. Moreover, not only had no-one ever done a Fractal before, not one of us had more than the vaguest idea how they worked. No-one had even watched a YouTube video or read a guide. Perfect! We muddled through. When we ran into something we didn't understand we talked to each other, offered suggestions and experimented. We worked out what we needed to do as we went along and while we died quite a lot, we got there in the end. No-one got angry or disheartened, no-one ragequit as we wiped yet again. No-one even mentioned that one of us was only level 40 and spent most of the time dead. It took over two hours but in the end we completed all three fractals put in front of us. I now have one character qualified to run Level 2. Which she duly did a couple of nights later. This time the group was more experienced and if anything chattier and better-natured even than the first. Naturally, things didn't go as well. The second group struggled through the first two fractals, could not finish the third and had to give up. That fractal was the same one the first group of complete novices got as their opener and they got through it, so experience clearly isn't everything. DPS is, at least for that one, and we didn't have it, especially not after someone bailed. We tried it once more with just the four of us but it was never going to happen. 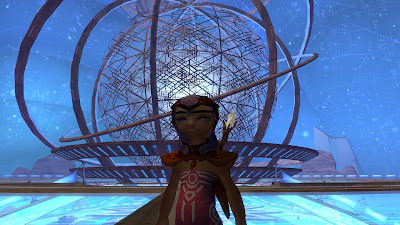 We agreed to call it a day and I returned to Lion's Arch still licensed only up to Level 2. The fractal dungeons themselves are beautifully designed. 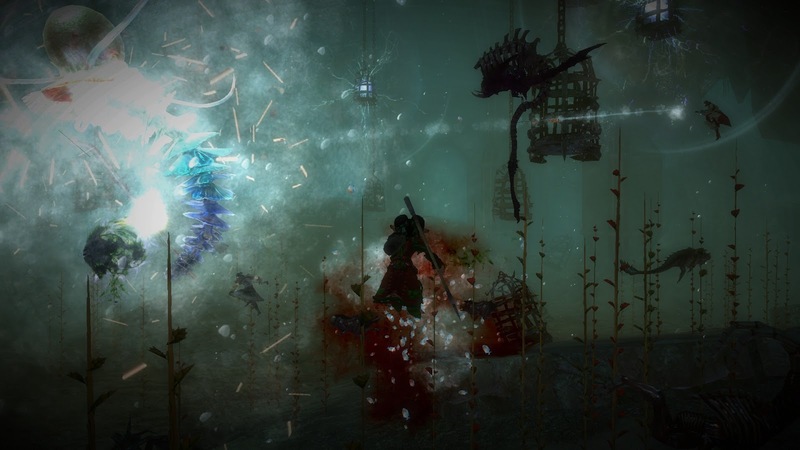 Visually and aesthetically, like everything in GW2, they are true works of art. I would love to be able to stroll round them in my own time an appreciate them fully, without swarms of mobs trying to rip my head off. There seems to be some kind of thin, overarching narrative based on Asura Anthropology and each fractal has its own storyline as well. Hard to follow or appreciate either when you never stop fighting, jumping, running, dodging or falling. I found the gameplay challenging, to use a popular euphemism. In plain English I found it annoying, irritating, fiddly, irksome and downright infuriating. Rarely did I find it fun. A lot of the concepts are great - running down a tunnel with a giant flaming boulder chasing you, smashing the chains binding a 500 foot high giant to a mountain, following mysterious footsteps through a blinding blizzard - great to watch in a movie, not so much fun to replicate through keyboard and mouse. The best bits were when I could stop and look around - some of the scenery is breathtaking - and the fighting. 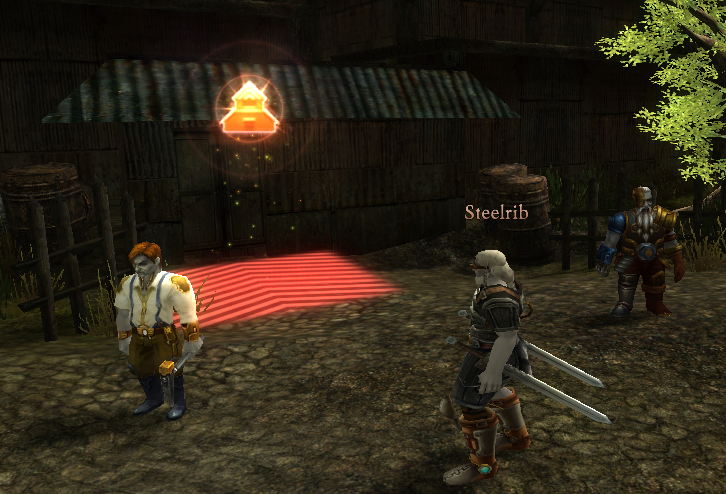 I like fighting in MMOs. I like playing my character and using my character's abilities and at least I was mostly allowed to do that as I saw fit. We had some very fun fights. I would personally prefer none of the gimmicks and tricks, just the nice scenery with some tough things living in it who resent a bunch of adventurers coming in to take their stuff. One more run this evening, even if it partially fails, should see my monthly completed. I'm quite glad to have had the spur to go take a look but I can't imagine running these things often, either for fun or profit. Just about anything else I've done in Tyria has been more entertaining. Well, not Orr, obviously. Or some of the Personal Story. OK, fractals aren't that bad. I did quite enjoy them, in a masochistic kind of way. 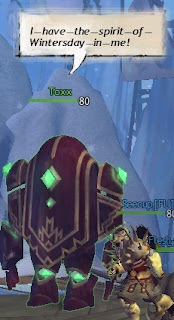 I certainly appreciate the way that doing them and the Tixx dungeons has bump-started my dormant PUG powers. Not only did my old LFG skills come flooding back but I even found I could still start, recruit and run a PUG. 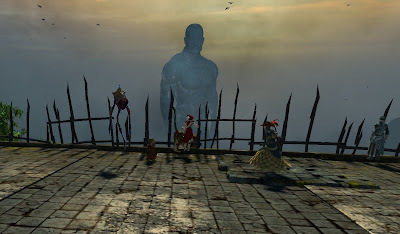 From a social perspective the whole experience was so much better than I'd come to expect from other MMOs of late that it really does put me in mind to do more just for the half-forgotten pleasure of meeting new people and sharing new experiences. 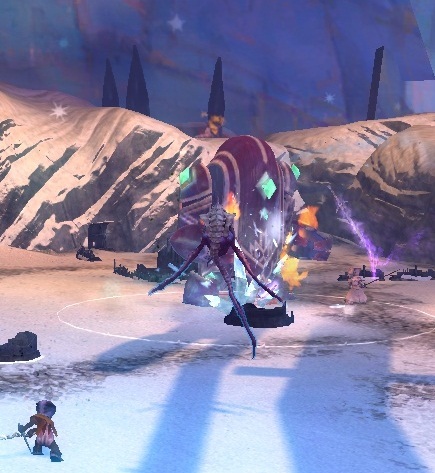 All the same, I didn't come to GW2 looking for dungeon-based pick-up-group gameplay. I still think it goes against the grain of the all-tag-on open world we were sold. Fractals may be a big improvement on the first iteration of dungeons but they are still isolated and isolating instances that remove players from the world. No matter how well it may be done that's not a direction in which I want to see the game go. 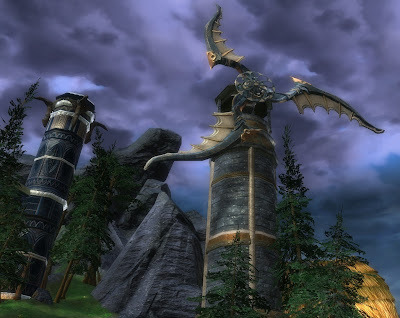 Let's hope that the promised addition of fractal gear to other parts of the world puts dungeons back in the special interest box and returns focus to the shared world outside. Beginning the day by reading Tipa's invigorating account of her recent adventures in Norrath hardened my determination to make good on my MMO Resolution. 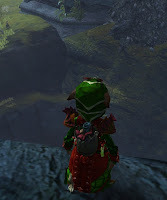 It's not even 2013 yet and I've already spent a morning somewhere other than GW2! First I had a chat with someone in the guild (yes, there was someone online and what's more they even remembered who I was). Next I patched up Legends of Norrath so I wouldn't miss out on my free packs (SoE recently changed things so that each month you have to log into the tedious card game that I don't believe anyone really plays or you don't get your freebies - it was worth it too because I got a free Prestige House in one of packs this go round). Then I had to re-allocate all 320 of my AAs (plus Prestige Points) for the umpteenth time. After all that it's a wonder I had any time or energy left to do anything else. Somehow I did, all the same. 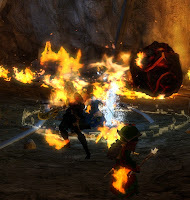 I ran through the new Frostfell instance set in a confectioner's kitchen in a New Halas house. The sweets were on a rampage thanks to some nefarious fairy mischief (oops! spoiler!) but I soon put a stop to that. Bits of gumdrop and gingerdread man all over! Glad I didn't have to clean up after myself. That's halfling work! The sweetmaker gave me a pet Gumdrop that follows me about like, well like an amorphous blue glob with teeth. I was very torn between that and the Gingerdread man dungeon activator but I'll get that on someone else. I plan on logging in and doing the instance several more times before it disappears on January 10th. I also bought all the new recipe books and made myself some scarves. 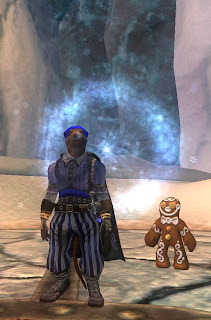 I think the red one looks magnificent with my blue pirate ensemble. All in all it felt great to be back. A change is as good as a rest to a dead horse as the old saying goes. Next stop, The Secret World. It's the end of the year and everyone's cracking out the crystal ball or counting the cost. We never celebrated this particular holiday in our house when I was growing up and while I did my best to help drink in the New Year as a student and for a fair few years after, it must be getting on for two decades since I last made any special effort to mark the turning of the calendar's last page. No predictions from me, then, and no looking back. Oh, well, maybe just a glance both ways as we cross the road into the future. I want my beta hat back ! 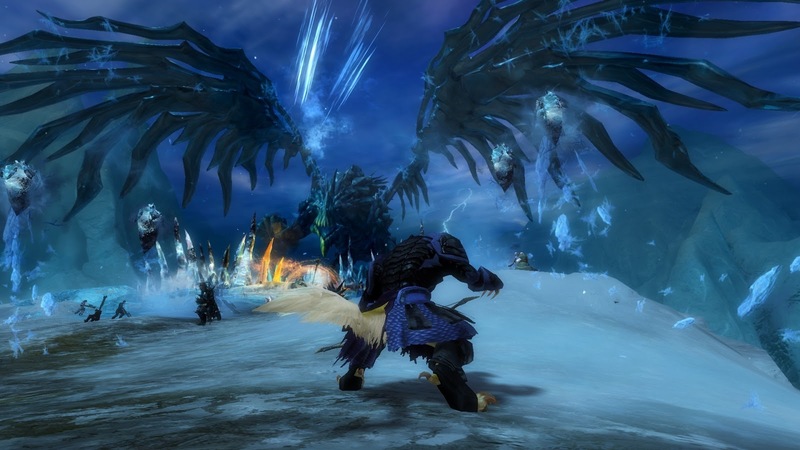 2012 was the year of Guild Wars 2. Beta weekends dominated the spring with the early ones marking particular high spots. I think the first two beta weekends still stand as my own personal high-water mark with the game. 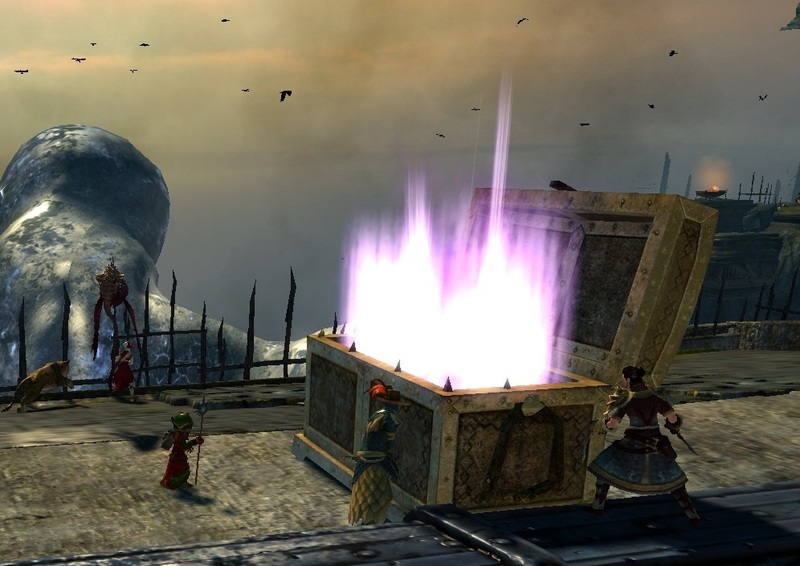 The overwhelming sense of a huge, unexplored world just over the horizon was at its peak then and my attempt to reach Lion's Arch on foot from Black Citadel lives on in my memory as vividly as my first attempt to reach Qeynos from Freeport a dozen years ago. After four months of intense Live play, that particular journey is about as exciting as going to the garage for a pint of milk but much, very much indeed, of the fascinating world of Tyria remains mysterious and unexplored. I still haven't passed 50% map completion on any of my eight characters and in my opinion the points of interest marked on most of the maps don't even send you to the most interesting places you could be exploring, let alone show you all of them. 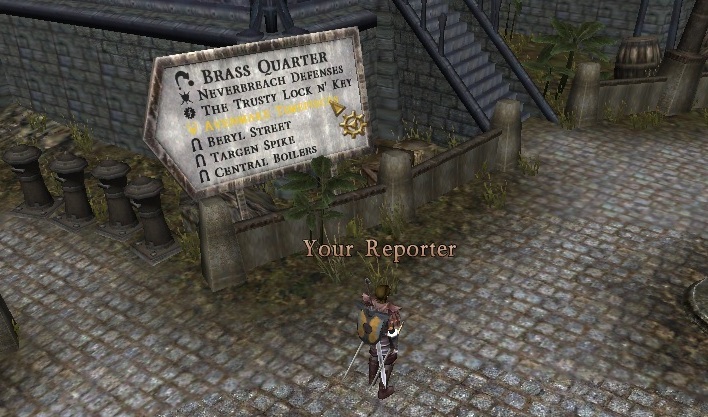 I expected to spend a lot of time exploring Tyria but I never expected largely to abandon my travels in favor of upholding the pride of the realm. Server! I mean Server! WvW has set a deep hook even to the point of creating a spurious sense of responsibility, so that when I'm not out there defending our keeps or pushing into enemy territory I feel a mild sense of unease, as though I'm not quite where I should be. I'm by no means sure this is a good thing, but the sense of camaraderie as I storm around the battlegrounds in the midst of a crowd of familiar names is undeniably addictive. GW2 is very far from perfect and I have a post in mind about it's faults. For all that's wrong with it, however, It looks set to last me well into the coming year and probably far beyond that. It certainly pushed Rift out of the running. Despite owning Storm Legion and being paid up to play until next November I've barely set foot in Telara. I did get as far as re-doing my Soul Trees for the umpteenth time (that gets so old - if I have one wish for MMOs for the future it would be that they stop resetting talent trees. Seriously, it's now at the point where that alone is enough to make me stop playing a game I'd otherwise keep faith with). I liked what I saw of the new continents but obviously not enough to get me exploring them. 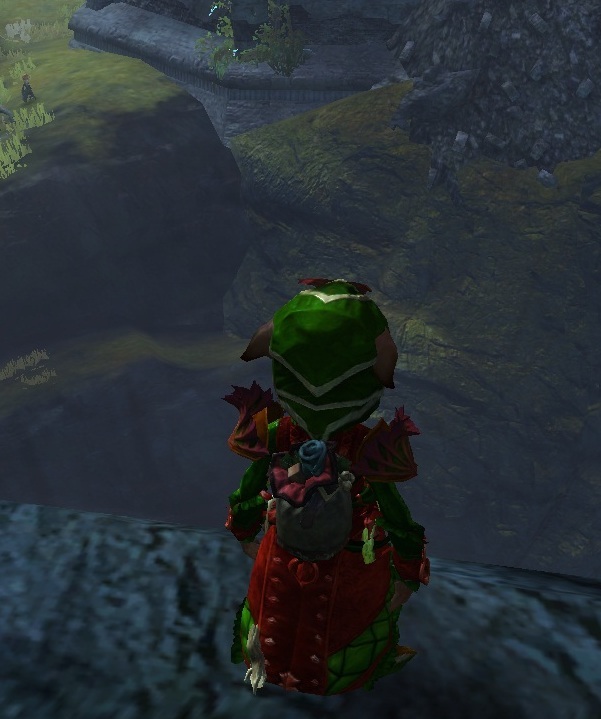 As for gameplay, Rift seems really, really dry after GW2. Staid and ponderous in fact. Is that sun rising or setting? The other big success of the year, from my perspective if not from it's producer's, was The Secret World. Again, the beta weekends were first-rate and indeed they sold me on the game, which I hadn't really been following and wasn't expecting to buy. I did buy it and played it exclusively during that short window of opportunity before GW2 launched. 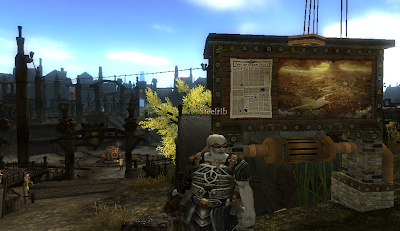 Perhaps the launch was badly-timed, since many said they were using TSW as a stop-gap before GW2, but to be honest the relentless grimdark of The Secret World had about worn me down after a couple of months and I would have needed to take a break about then anyway. 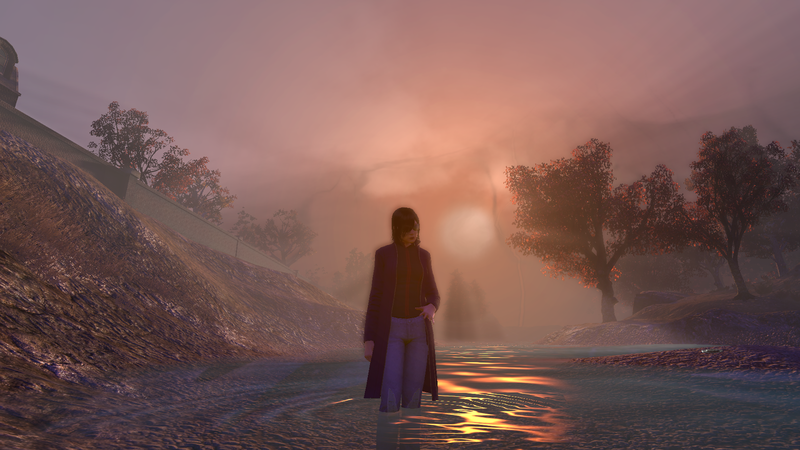 Enough has been said, not least by me, about the top-notch quality of the story, voice acting and writing in TSW. 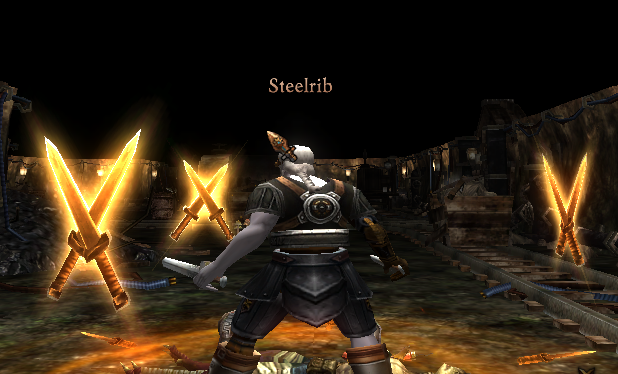 I also very much enjoyed both the combat and the skill system, which weren't as universally popular. The new buy-to-pay model is, I think, the right one and the one Funcom should have started with. Since I have already bought the game it's now just down to me to find time to play it. And that's the perennial problem to which I have no solution. 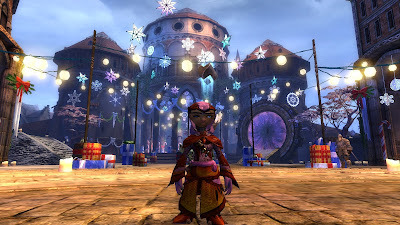 Too many very good MMOs, too little time: the theme of 2012 and set to continue. Much talk about MMO implosions and the retraction and retrenchment of the genre continues but interested as I am in those trends and speculations on an academic level it remains personally irrelevant when there are literally dozens of MMOs I want to play but don't have time for. A huge winnowing that reduced the number of existing MMOs to a tenth of it's current number would still leave me looking at a choice of far more than I could hope to experience in reasonable depth, so why should I worry? Clear out the deadwood and I'll climb the highest tree left in the forest and see what I can see from up there. The other two games I played most in 2012 were EQ2, from which I am on hiatus but to which I intend to return, if briefly, this very weekend and City of Steam. For all my lauding of the beta experience in general and the new black of beta weekends in particular, CoS is the exception. Oi! You! Mechanist Games! Will you just get on and launch already? I want a permanent character! I want to just get on and play! 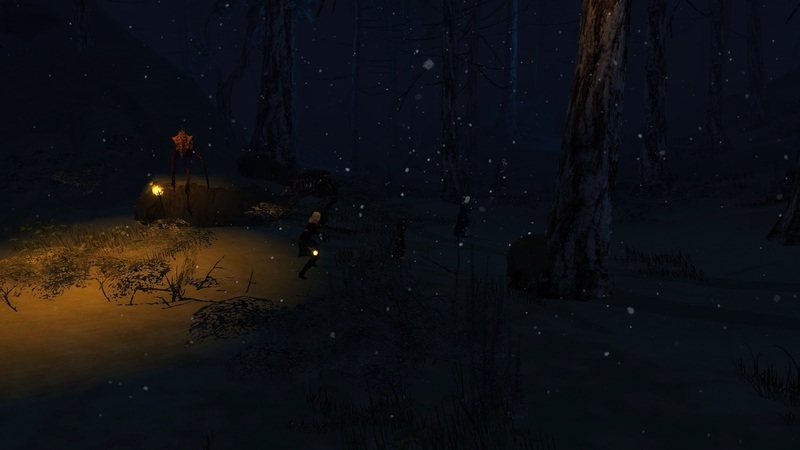 Your game was more polished in Alpha than most MMOs are six months after launch. If you polish it any more you'll rub a hole in it. 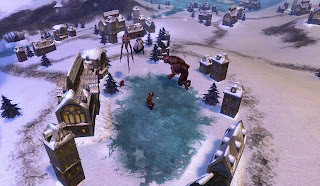 Apart from City of Steam the MMO I'm most looking forward to in 2013 has to be Neverwinter. It takes place in a setting I know and like, it's traditional fantasy with which I am so not done yet and almost certainly never will be, and best of all it offers authorship options. That's the good part; the bad part is, no-one seems very confident about when it will actually appear. Same story for WildStar, second on my list of anticipated releases. Lots of PR, little hard information. I wouldn't be that surprised to be sitting here this time next year with neither of these even in beta yet. No such fears for FFXIV's relaunch, which has a very solid timetable for beta. I still would like to play this, although I can't imagine paying a subscription. I'll be signing up for the beta when they begin taking applications and at the very least there's a two-week open beta at the end of the process offering a guaranteed taster before any money changes hands. I'll be there for that. And I haven't forgotten about The Missing Ink. I'm just hoping RedBedlam make good on their promise to bring it to Android. It would be just perfect on a tablet. Get more variety into my MMO diet. Play more titles, play shorter sessions, spread myself about. I'm happier overall when I'm spending no more than two-thirds of my time in one MMO, making meaningful progress in three or four others and footling around in five or ten more around the edges. Gives me a lot more to write about, too. 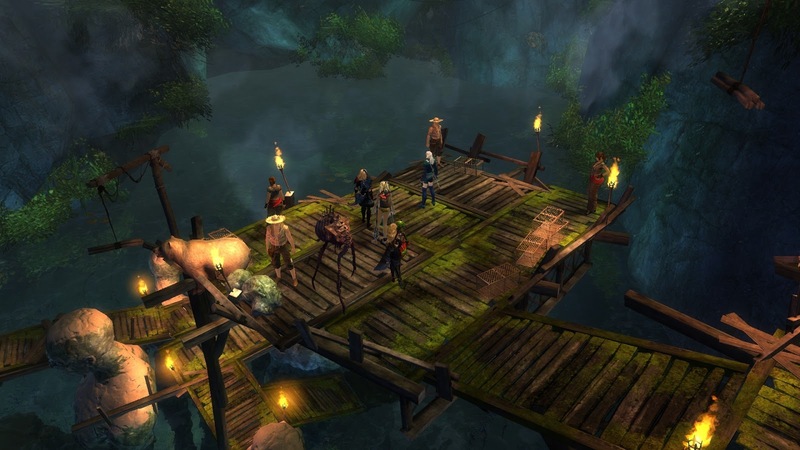 Real MMOs will begin to appear, or at least be announced, for the Tablet market. 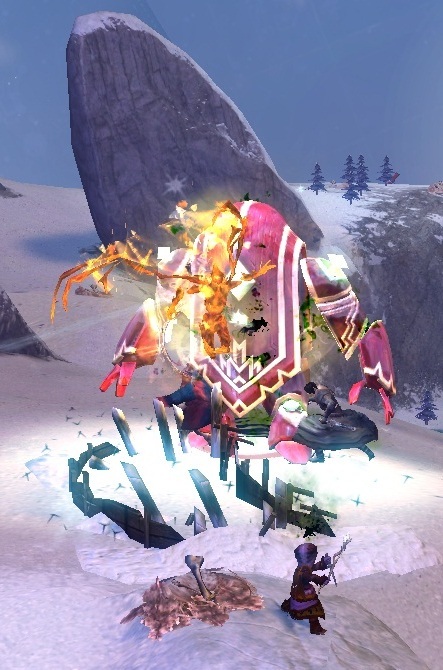 Arcane Heroes was a good start but much more can and will be done. 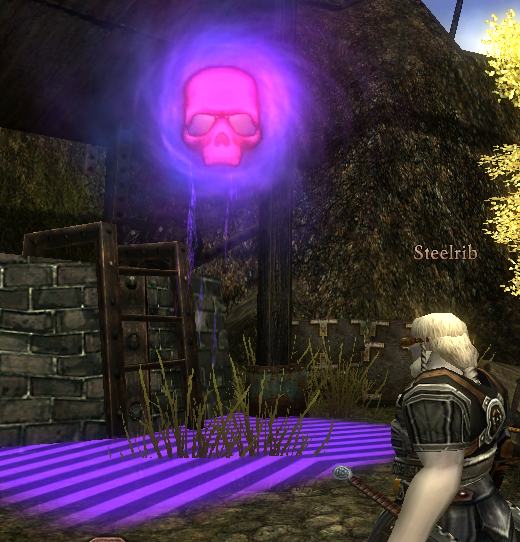 There will be retrenchment in the PC MMO market and some well-known titles will disappear. Not any really well-known ones, though. The strong will get stronger as the herd is culled. No matter what happens it will be reported as the End of Days and after the dust settles we will all carry on as if nothing had happened. Like we always do. Just before Christmas Rowan at I Have Touched The Sky pointed out that a dynamic world doesn't necessarily mean one where dragons set your hat on fire every five minutes. A few "Men at Work" signs and two Charrs warming their paws at a brazier can be every bit as dynamic as a zombie uprising. 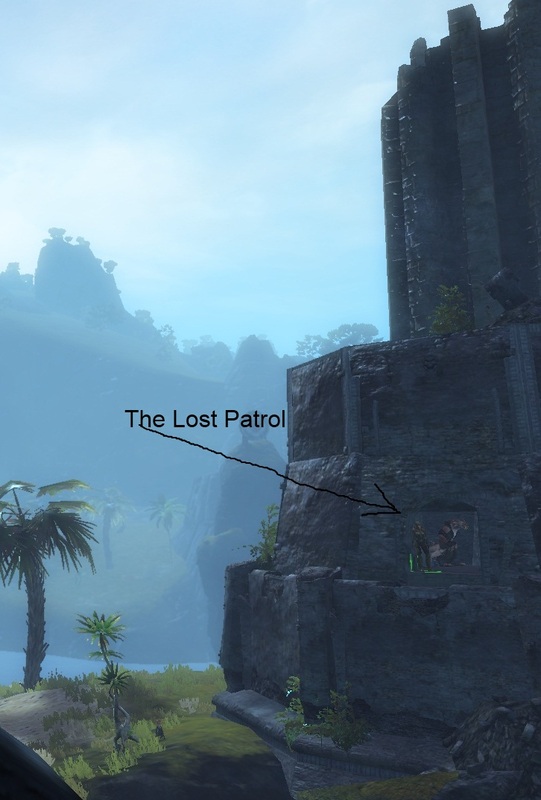 I was banking in Lion's Arch the other day when someone asked in map chat what was going on with the lighthouse. I recalled that it had had the top knocked off it during the Karka invasion but it occurred to me that I hadn't taken that to heart the way I had the Mad King's demolition job on the Lion statue. Indeed, I hadn't even been to see the damage, so off I toddled to take a look. The situation is confused, to say the least. Several weeks after the crabs were sent packing construction seems to be well under weigh on a new lighthouse. It stands, partially built, on a different rock with a spiffy new bridge leading to it. The severed stump of the old lighthouse is now isolated, bridgeless and unreachable. Only no-one seems to have told the Lionguard, several of whom can clearly be seen stranded on the remaining upper floors with no obvious means of escape. Neither have the cartographers been informed, because the mini-map still shows the old bridge spanning what is now clearly a fatal drop. Anyone navigating with their eye on the map not on the ground, as I have often been known to do, is going to run slap into some content rather more dynamic than they bargained for! Because nothing says Christmas like a Necromancer doing The Robot. 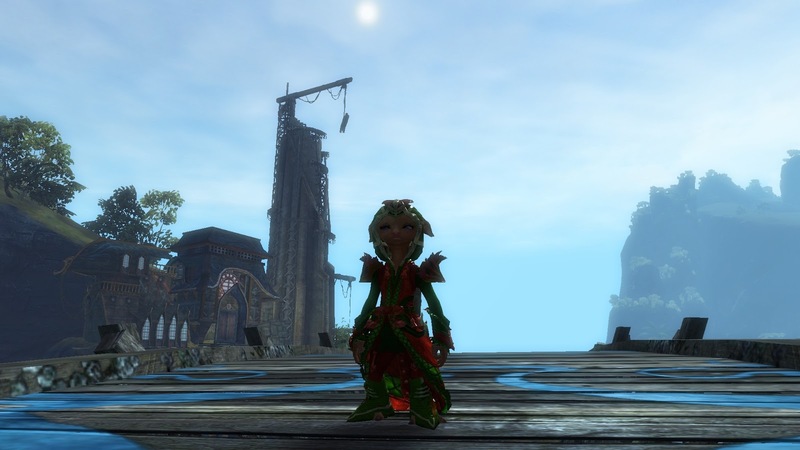 It's still all Guild Wars 2, all the time Chez Bhagpuss. My good intentions of revisiting The Secret World have so far gone as far as getting the thing patched up but not as far as logging in. I don't think Rift is even patched. 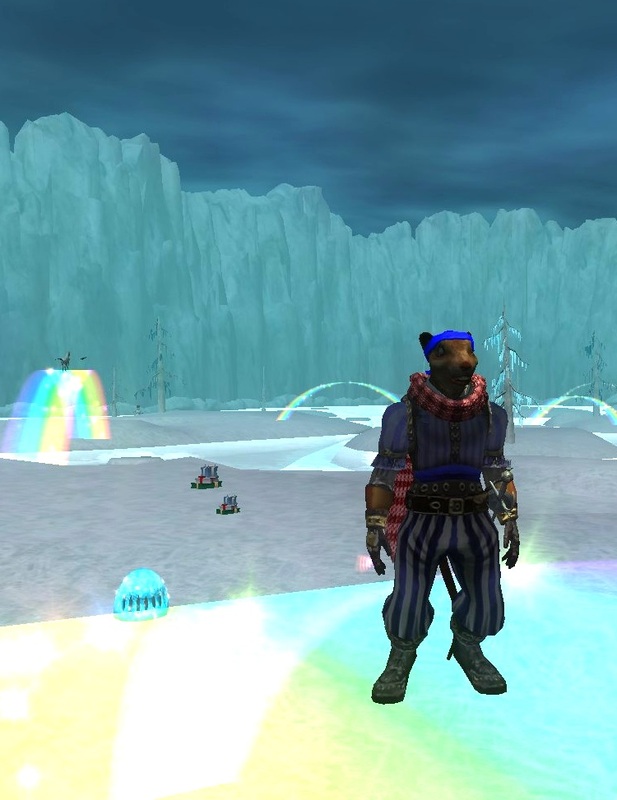 Plans to step back into Norrath for Frostfell have as yet come to nothing. That has to happen, though. Have you seen those scarves? I resisted the siren call of Triple Station Cash yesterday because I already have thousands stashed on two accounts from previous bargain days but when I really stop to think about it there's almost never anything in the store that I want to spend it on, so no matter how much of a bargain it is, hording SC is a bad idea. It's a shame they put a stop to buying expansions with it because I'm starting to get an itch for Chains of Eternity. Only the certain knowledge that I don't have time to do it justice is keeping my credit card in my wallet. Would that my rational mind had been on such active duty several evenings ago, when in a fit of rioja-induced enthusiasm I paid $9.99 for access to Asheron's Call 1 and 2. Obviously it was only AC2 that I was interested in but so far I have seen nothing of either. Both downloaded perfectly and promptly and my account page shows me fully paid up until January 18th but the log-in screen resolutely refuses to accept my password. Turbine's arduous customer service process has yet to provide me with any response beyond unhelpful, automated emails. I'm now at the point of asking them simply to refund my purchase because I have no confidence in their processes. If I don't get a response soon I guess I will be forwarding the correspondence to my payment provider and calling on U.K. consumer law, which is rather strong in this regard. That's if I can be bothered over a loss of about £7.00. 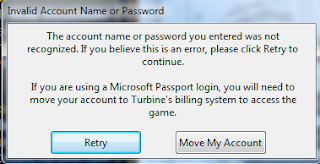 I might just write it off to experience but if so it will be the last money Turbine ever get from me. Much more positively, GW2 remains a joy. I now have four level 80s - Ranger, Engineer, Warrior and Necromancer. Next on the assembly line is Guardian. At this rate I should have the full set before Easter. I am intending to play my Necromancer in WvW, so she can't just go into retirement dressed in whatever mismatched set of blues and greens she hit 80 with. I've had two runs at the Trading Post so far and done some research and quite honestly I begin to lose the will to live. I really don't want to spend time "gearing up". It's very, very boring. Buying gear because of how it looks is fun. Comparing endless stats really isn't. It also costs a fortune. I could make the money flipping stuff on the TP easily enough, but that's even more tedious than comparing stats. I really wish their was just a "gear me up to average standard" button I could press. 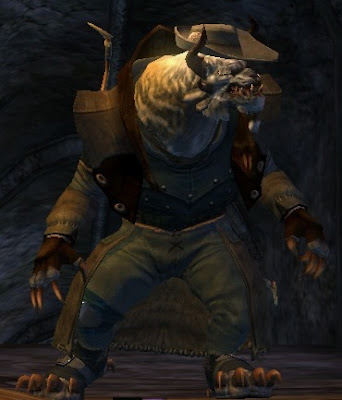 Like choosing from Talent trees and assigning skill points, all this is stuff I could do without, and for my normal playstyle I often do, but I will just have to grit my teeth and bull through this time because in WvW gear does matter and I like being effective there. I wish I'd read the farming guides before I dinged 80. I could have done the last ten levels in certain spots and gathered enough gossamer to see me through to a full set of Carrion Exalted. Remember that for the next four times! I'm hoping to do some Fractal dungeons to complete my monthly so maybe something will drop there - I guess there are drops? One way or another, gear will be gotten. On the subject of dungeons, doing all the Tixx instances has had the pleasant side-effect of allowing me to remember why I used to like doing dungeons. Everyone in the pick-up groups has been at worst silent and at best good company; no idiots, no time-wasters, no snark. They are very easy dungeons, which may help, but it bodes well for the Fractals. 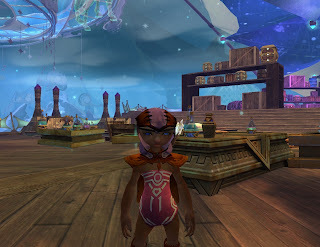 Enough - time to go think about which mini-pets I'm going to make with my cogs and what Endless Tonics I need. Mrs Bhagpuss spent much of yesterday running around the Frontier as a Princess Doll with a Princess Doll pet, recreating the closing credits of The Benny Hill Show with Ehmry Bay as extras and I want a go! I barely managed to log into last weekend's City of Steam beta, the third of four. The one thing I took away from my very brief visit is how slick the whole thing is begining to look and feel. I'm not at all sure that I like it. 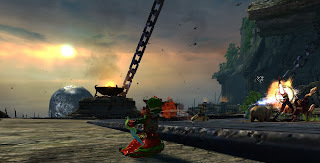 Giant flaming swords spin around me as I fight. Why? City of Steam is one of the MMOs I've followed most closely for the widest span of development in all the time I've been playing MMOs. I've played many betas, several, like EQ2 for example, from the earliest closed-beta stage, but City of Steam is the only one I've ever started testing in pre-alpha and stuck with from then on. I think it's fair to say that most MMOs I've played in both real beta versions (where changes are still being made to fundamental game concepts) and in their final live versions were at their best for me at some point during the beta process. I'm not talking about the experience of playing the game with the traditionally friendlier, more open-minded and definitely more laid-back beta playerbase but about the game itself, its systems and design. At some point in beta MMOs tend to hit a level of completeness that satisfies me - one where the basics all work but there aren't yet many frills. That's how I like my virtual worlds - solid, workmanlike, even a little bit plain. City of Steam was already close in pre-alpha and by the end of alpha testing it was nigh-on perfect. I knew this was a dungeon without the Purple Glow of Doom. Beta has brought frills and lots of them. Everything's being shined up. It's the dreaded polish. At the same time things I enjoyed having to work out for myself, that contributed to making the world a fascinating puzzle of a place, are now being signed, roped off and generally marked open for business. I preferred it a little rougher around the edges. 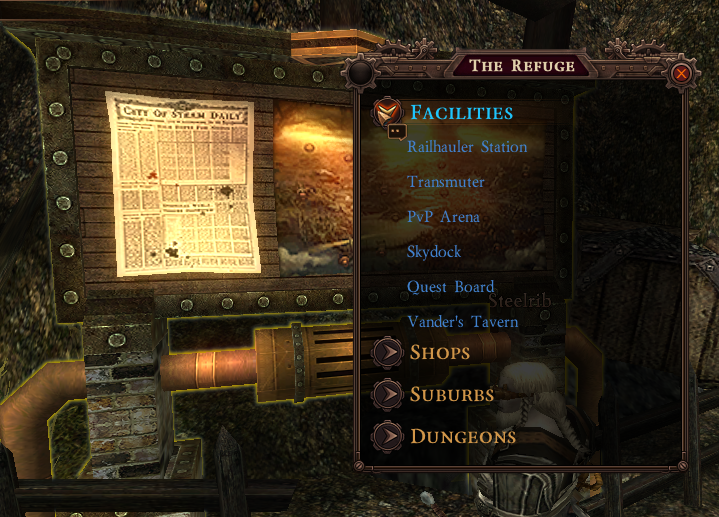 None of this changes the fact that City of Steam is going to be a very good online-RPG/MMO. It is and I'm very eager to get stuck in to my permanent characters and start playing the hell out of it. What it does mean is that, for me, by the time it releases I will already be nostalgic for the glory days of Sneak Peak and Alpha. That's both my punishment and my reward for being an early adopter. Your reviewer caught Tixx's first show at The Grove: Full Review here. For the second show at Divinity's Reach two nights ago promoter Tixx pulled out a totally new set. Toxx emceed main stage action from fresh act The Princess Dolls. Real screamers, these girls! Plenty of costume changes kept things moving and a mid-set face-off between the Dolls and Tixx regulars The Ventari saw the crowd taking sides. No love lost there, or is it all just play-acting? Despite a full scale invasion from Tixx's crazed skritt fanbase that had bouncers literally throwing the little rats off stage and ongoing technical problems with some of the special effects (are those turrets really worth the trouble?) Tixx's superior new material shone. By curtain-down Toxx, clearly in a "tired and emotional" state once again, had to be forcibly removed from the stage. A triumph. Toxx busts out those moves! Last night at The Black Citadel things didn't go quite so smoothly. Tixx mixed numbers from the first two shows with variable success. Some sequences didn't gel and the whole show felt bitty. Toxx was particularly off-key for much of the set, missing several cues, coming over like a James Brown wannabe with all her false exits and pretend collapses. The turrets malfunctioned yet again and the whole performance was dogged by technical problems throughout. The show was saved by the late surprise guest appearance of The Toy Soldiers, a Charr ennsemble with an astounding sound. Things never stopped popping the whole time they were onstage. Toxx finished the show in her (fortunately) inimitable style, unveiling a spectacular new dance routine right at the end that brought things to a truly explosive close. Overall rating chaotic but cool! The Toy Soldiers - these guys rock! Just two more out-of-town warm-ups to go. 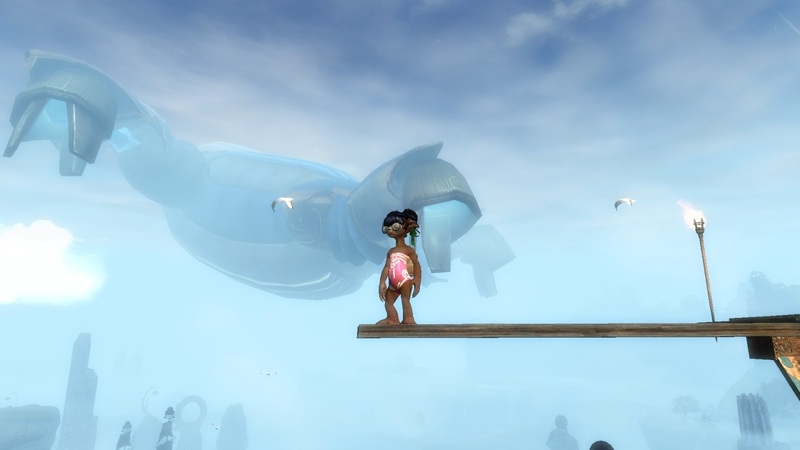 Toxx's airship hall has vast capacity so no need to book in advance, just roll up at Hoelbrak tonight (wear something warm!) or Rata Sum tomorrow. 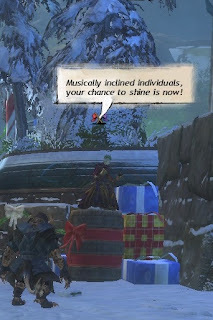 After that catch Tixx at his Wintersday residency in Lion's Arch where we hear he'll have the whole crew performing the full repertoire for the entire season. Let's hope those technical problems are all ironed out by then. That's what these provincial junkets are really all about, or is that just too cynical? Whatever! See you in LA! The arrival of Tixx Toymaker's vast golemic airship turned out to be a massive anti-climax. No, that's over-stating it. For an anti-climax something needs to to happen. This was a non-event. For a brief second I thought I caught sight of a vague shadowy shape in the sky above The Grove but no, it was just a cloud. As the appointed time passed the mass of adventurers clustered in the cabbage capital ceased watching the skies and gave voice to their traditional cry - "LfP!" The toyship had landed and I never saw a thing. Really, could we not at least have had a cut-scene? I couldn't even find the entrance to the dungeon. The entirety of our three-person guild was there and grouped and the first I saw of Tixx's Infinirarium was when the window popped inviting me in. Luckily someone has keener eyes than I do and worked out where the entrance was or I'd probably still be looking for it now. Inside Tixx's ship things improved. 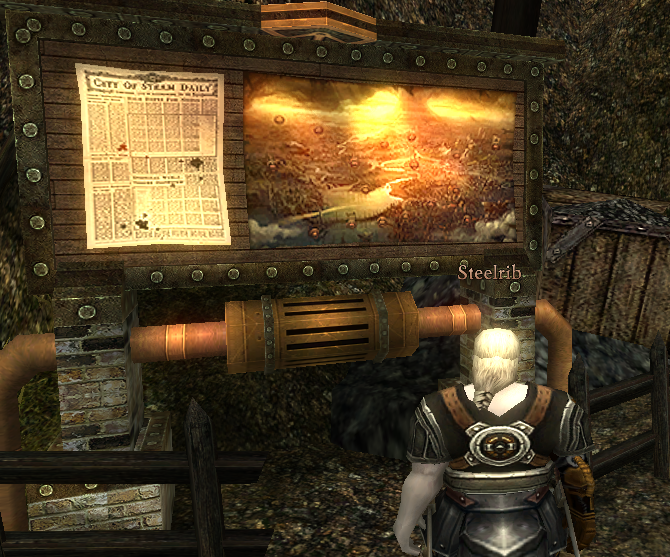 Like all GW2 maps, with the arguable exception of Orr, this one was fascinating, detailed and gorgeous. I found that out at the end, after all the mobs despawned. Not much chance to sightsee before then. That's the trouble with dungeons - someone's always trying to kill you, which makes it hard to admire the soft furnishings. The battle came in several parts. First we had to fix two malfunctioning machines on opposite sides of the room. Naturally we couldn't use normal tools. No, we had to kill tar elementals and stuff their juices into the pipes while skritt ran around dementedly being skritt so we had to kill them too. It would have been fine had one of the machines not had a leaky pipe. The faster we poured tar in, the faster it flooded out again. I'm still not sure if this was intended or a bug. Only one of the machines did it and nothing in the explanatory notes mentioned it. Either way it meant the first phase took as long to complete as the rest of the dungeon put together. We got it done eventually and moved on to phase two, kicking skritt off the flight deck, which only took a couple of minutes. Skritt kick easily. Next came collecting plants. I have no idea why. There was some spurious justification which I missed. After five minutes of random running about in the midst of yet more gibbering skritt, the sharpest of us (it wasn't me!) finally noticed that the locations of the plants we wanted were all marked by dirty great orange splodges on the mini-map. Things went faster after that. I could get inside that church! Does no-one ever think to add an emergency override? 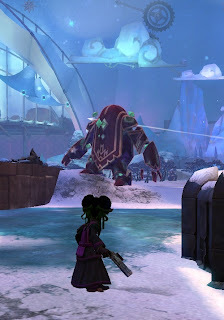 Finally we had to defeat Tixx's demented assistant Toxx, who was either a golem or an Asura in a suit. If there's a difference. The fight went smoothly. Well, it went smoothly once two of the three of us had teleported back from the Bridge, where we mistakenly thought Toxx lived, to join our smart friend, who'd learned from experience and found the big orange "Toxx is here" marker on the map. If Toxx had any special tricks I didn't spot them. Our group was all casters - Necro, Elementalist and Mesmer. 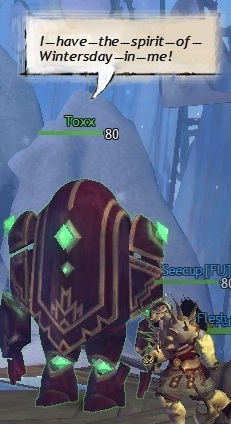 My Flesh Golem tanked and we all stood at maximum range. The fight lasted a few minutes then Toxx fell over and two things happened. A loot window with a confusing number of choices in the form of an equation opened and a large chest popped a hundred feet away. It would have been easy to miss the chest altogether while figuring out what the heck the loot window wanted. It wanted us to choose a toy. Being the first of the five dungeons, there was a choice of one, so I chose that. I now have about a third of the components to craft a Ventari Mini-Pet in the Mystic Forge. Whoop-de-do! The chest contained three Masterwork weapons, which I vendored. The other two vanished sharpish and I stayed to explore and take photos. As you can see, I was down to my fetching all-in-one hot pink swimsuit by then. The coin reward covered repairs but that doesn't seem to be a service Tixx provides in-ship. All in all it was fun for a given value of fun but I can't see myself doing all five. 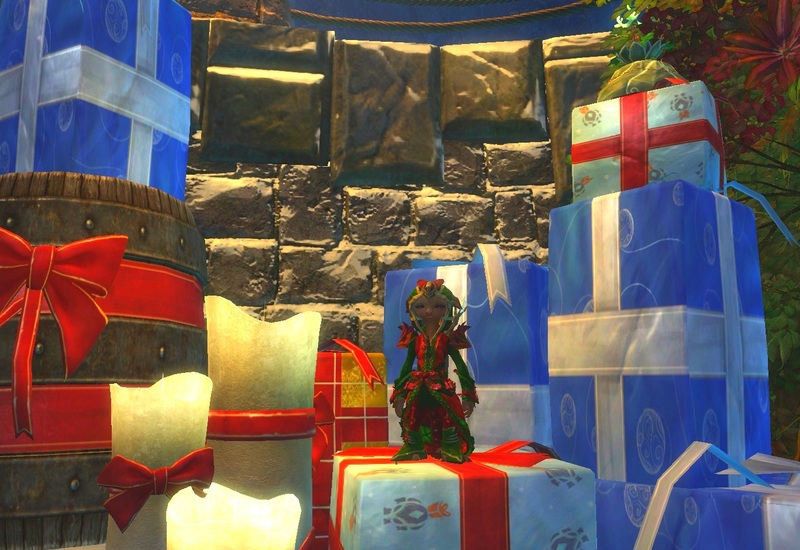 Much, much more fun are the giant presents that drop all over Tyria. 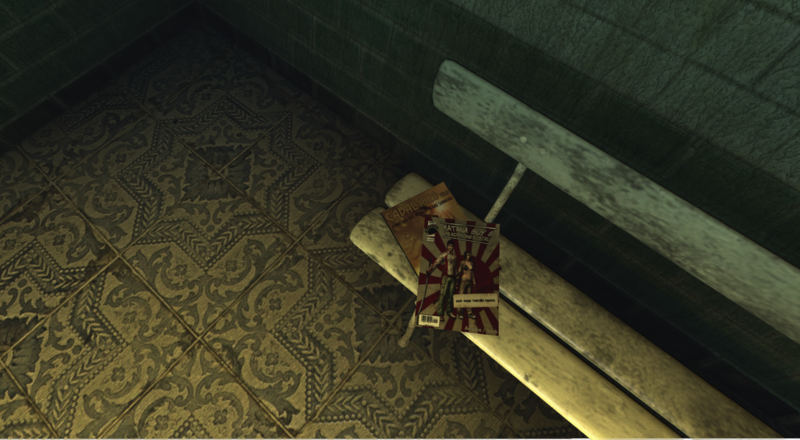 We spent a good deal of time tracking those down and unwrapping them. When the paper comes off everyone falls over and out burst either half a dozen skritt or a pack of Ventari toys. This is the one time in your life you'll be praying for skritt. Six skritt is clearly nowhere near enough for the hive-mind to kick in. 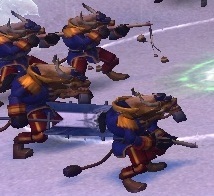 They handily clump up and can be AoE'd to death in very short order. The Ventari, on the other hoof, rapidly spread out and lay down intersecting rings of withering arrow-fire. They also have an insane retribution buff. There's a bitter thread about them on the forum and they are indeed a nightmare to solo. Even in a duo it's touch-and-go. They drop socks, though, so you can't just grab the present and run. I'm collecting socks and jumpers for...well I don't know what for. There's not actually anything on the swap list that I want. I might get a pair of hand bells. Mrs Bhagpuss has been much luckier than I, getting several recipes, a potion and the hand bells inside her dropped presents. I just get more socks. It's a lot of fun trying, though, and it's early days yet. Tonight Tixx visits Divinity's Reach. I'll probably skip. Ehmry Bay are kicking up rough in the Borders and all leave's been cancelled. I'll catch up later when the carnival rolls into Lion's Arch. By then everyone should have all the strats down pat and I can just leech. It's the Necro way! Always start discussing something before you have any idea what you're talking about. It's the internet way! 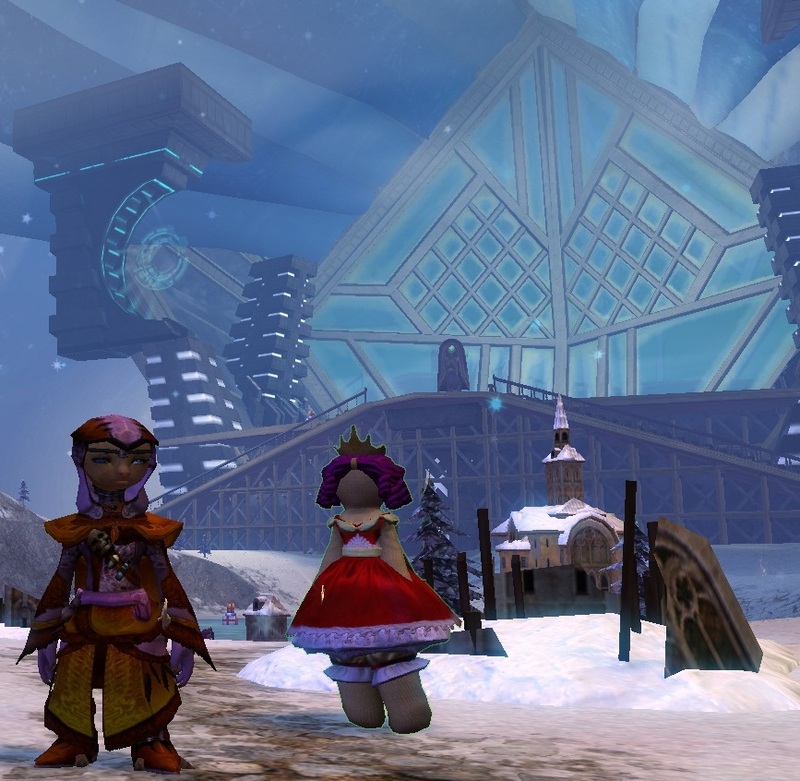 Heavy snow fell in Lion's Arch overnight and it looks fantastic. 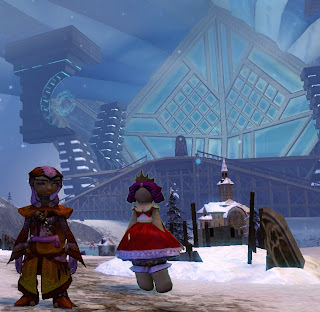 Maybe it's magic, maybe it's Asuran technology, whatever it is the snow's held its pristine, untrammeled whiteness despite hordes of heavy-booted adventurers stomping through the city, drawn in by rumors of loot. Adverse weather conditions didn't affect the raising of street decorations. Boy, how it didn't. Candy canes the size of lamposts, strings of glitter-stars from eave to eave, more trees than Caledon Forest - the Authorities really went to town on this one. Who knew pirates were so festive ("ex-pirates, but I get your meaning..."). Piles and piles of gaily-wrapped presents everywhere, too. What's in those, anyway? 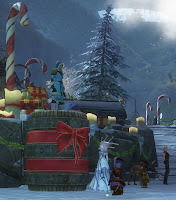 Somewhat unexpectedly, the festive theme extends as far as both The Mists and The Frontier. 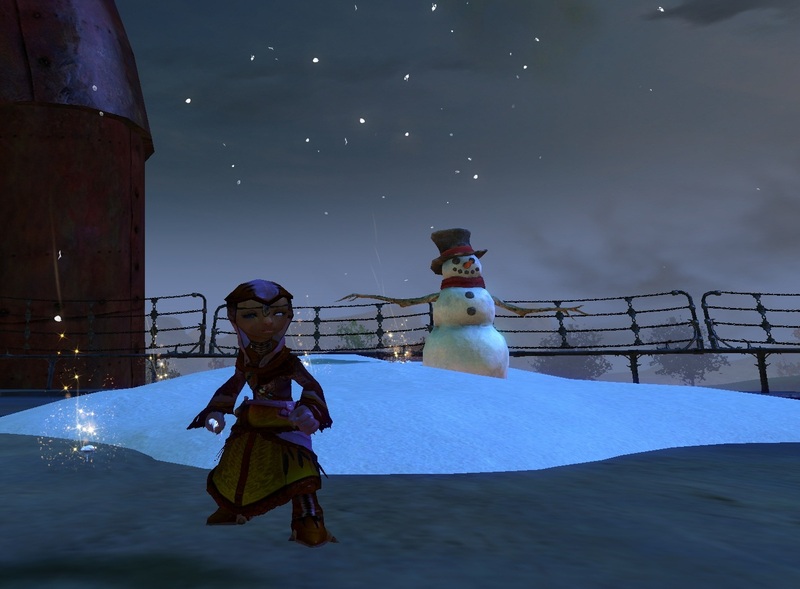 On porting up (I always think of the borders as "up", don't ask me why) to Yak's Bend Borderland I thought for a moment I'd walked through the wrong Asura Gate and ended up in Santa's Workshop. 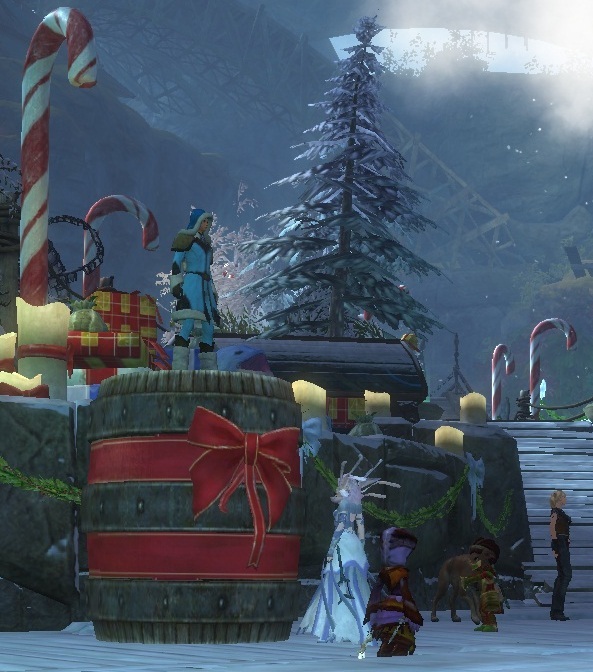 If anything, our Citadel is more heavily decorated even than Lion's Arch. Is that appropriate? The decorations do stop at the doors but I wouldn't be surprised to find our trebuchets lobbing Wintersday Puddings and our mortars firing Roast Moa as the season rolls on. 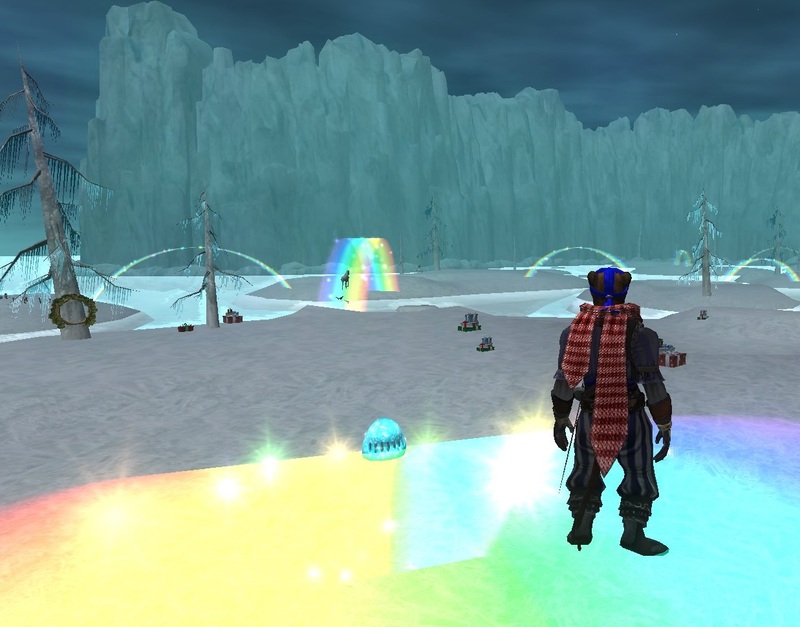 'Tis the season to play mini-games. I found three. For the first I spoke to The Bell Maestro, who sent me to meet a series of snowmen, each of whom shoved me onto a stage with two other players and set us to ringing hand-bells. The main instructions were largely incomprehensible. The brief advice the snowmen give is more helpful but still, after twenty minutes and a dozen or so rounds I had little more idea what I was doing than when I began. I certainly wasn't making any progress or gaining any understanding so I moved on. I will try again, though, because while it may have been pointless it was pretty good fun. Who doesn't enjoy ringing hand-bells? Next I spoke to the Festive Lionguard. There are lots of those, but only one stands on a barrel by the Mystic Forge Snowglobe and he's the one with the power to port you inside. 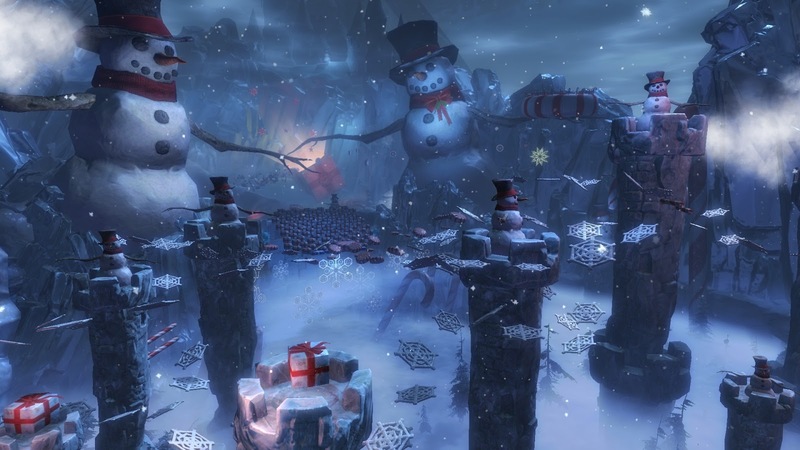 Once there you get to play an Arena match called Snowball Mayhem. The instructions seemed much clearer here and I really liked the pre-made skill sets, especially the one that turns you into a giant rolling snowball to crush your enemies. Rolling round and round on top of a downed opponent to finish them off is hysterical. Can see myself playing quite a lot of this. Last, and very definitely least, the inevitable Jumping Puzzle. A fey stripling going under the bland moniker of "Festive Youth" sets this one off. I tried it three times. The first time I was trying to take a screenshot and the first snowflake I was supposed to hop onto had already melted before I was ready to begin. Second time I fell off after five hops. Third time I did about eight and fell off. I would guess that put me about 1% into the puzzle, if that. Sod that for a game of soldiers, it's not what I call entertainment. Doubt I'll be going back. I'm also guessing that completing these mini-games gets you something. It didn't get me anything, but then I failed at all of them. 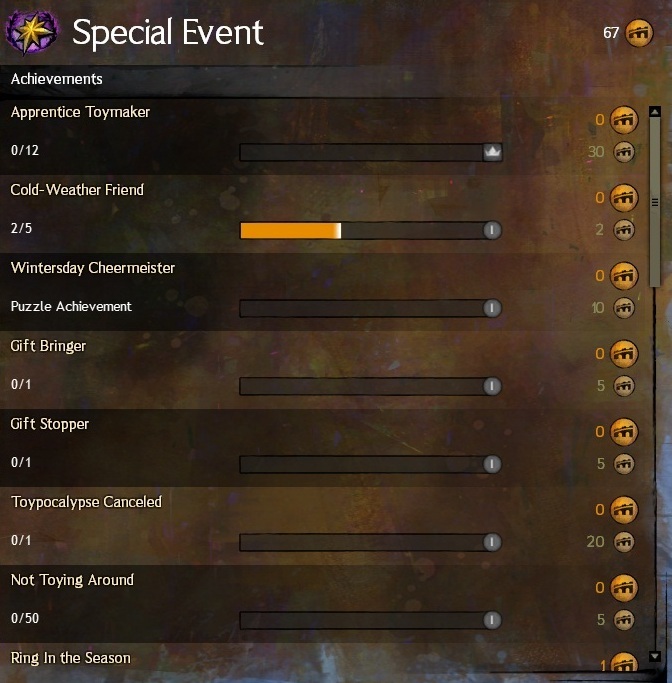 Not like GW2 to miss the opportunity to reward you just for turning up though, so maybe I missed something. Oh, come on - I probably missed everything! Oi! That Went Right Down My Neck! 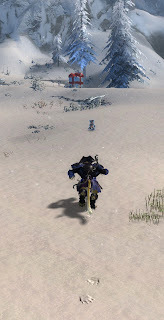 What would a winter festival be without snowballs? More orderly and better behaved of course, but where's the fun in that? 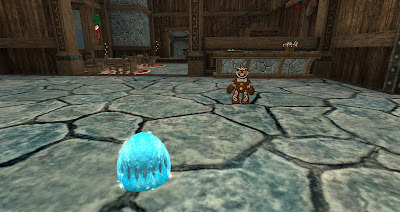 Snowball fights in EQ2 can happen pretty much anywhere, can go on until someone runs out of snowballs and require no consent from the snowballee. Just like real life, in other words. 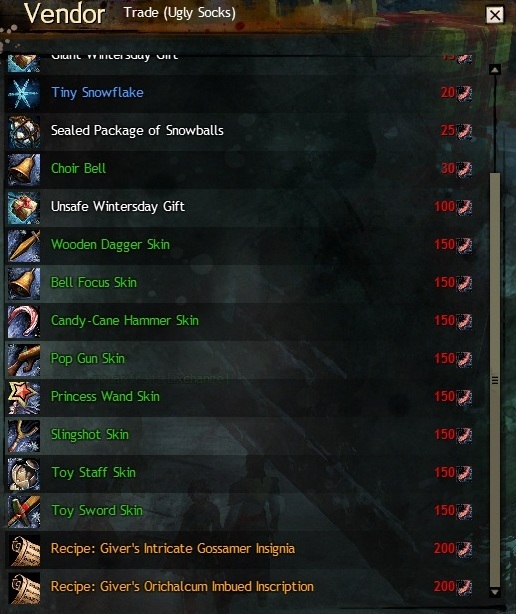 In Tyria first you have to build a snowman. I was hoping that might actually involve, y'know, doing something with all that snow lying there in a heap, but it happens automagically. 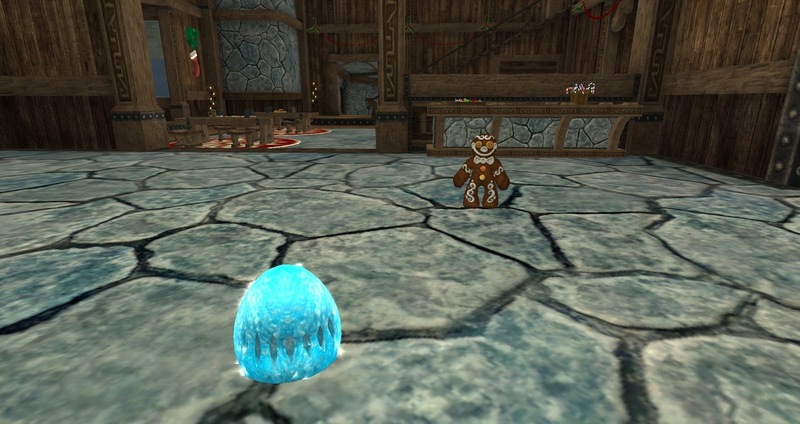 Once up the snowman scatters snowballs all around and you pick one up and throw it. One throw, that's your lot. As far as I can tell you can only hit someone else who's also carrying snow. Not sure about that - I lost interest rather quickly when I realized I couldn't just pelt them at all and sundry. Of Achievements, of course. Most of them seem to revolve around Toymaker Tixx and he's not due to make his first stop for another five hours as I write. At The Grove! (boo, hiss). At least that gets it out the way early . I'm not much of a one for Achievements so I'll just be letting these fill themselves out in the background, or not. Mostly Not, I imagine. When it comes right down to it, it's all about the presents, isn't it? Did you get what you wanted? Thought not. Well, don't be glum! 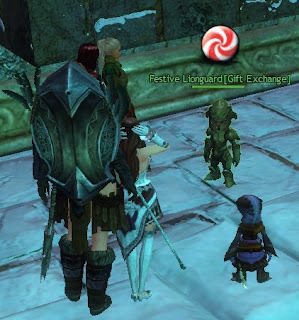 The Lionguard found they were so short of real army work after beating back the Karka that they had time to set up an Unwanted Gift Exchange. I don't know about you, but when I get a badly-knitted sweater that doesn't really fit I always take it down to the local army barracks to swap it for a toy sword or a slingshot. Only thing is, I don't have any presents, wanted or unwanted. And that's not actually what they take. They take some new currency the name of which doesn't display and the icon for which looks like a strip of bacon. 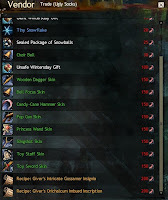 Couple of things on the vendor I might like to have, so I better find out where to get the new moolah. Last but very much not least, work continues on rebuilding the Lion statue. The fish are back! Not spouting yet but it's great to see them. Nearby more building work is under weigh for Tixx's Infinirarium (I do not believe that's a real word). I'm just happy it's not me that has to use a lump hammer in this weather. 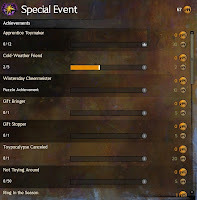 For a first appearance event it looks very full of content. There are a number of infrastructure changes that might merit separate analysis too. Mini-games in general don't do an awful lot for me and jumping puzzles even less, so I wasn't expecting much there and what we got looks like about what I expected. 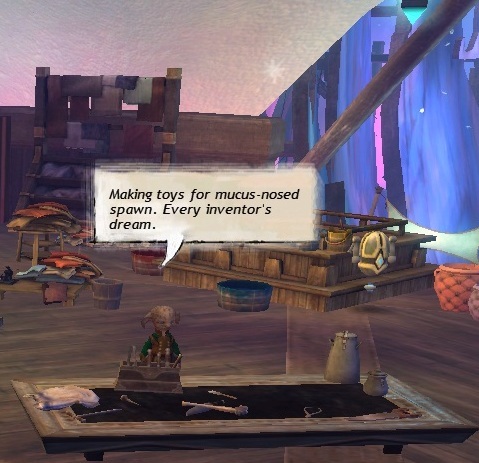 I'm much more interested in Tixx and his Toypocalypse (and that's not a real word either!). All in all, a very fine start to what looks like a fun holiday. Cats! Come On, You Love 'em!